Falsehoods about * Collectivization * The Famine * The Kirov Murder; * Trotsky’s Lies * The Moscow Trials * The Spanish Civil War * The Military Purges * Yezhov’s Conspiracy * plus many other falsehoods. Sale price if you order it directly from me is 1/3 off: US$20, postage included. (Only for orders in the USA). If you would also like some inscription on your book, please tell me. "In October 2017 Stephen Kotkin, professor of history at Princeton University, published “Stalin. Waiting for Hitler, 1929 – 1941.” In it, Kotkin accuses Soviet leader Joseph Stalin of dozens of terrible crimes and atrocities. The appearance of Kotkin’s scholarship is daunting: 909 pages of text, more than 5200 footnotes, and 47 pages of bibliography in tiny, triple-column type. But Grover Furr has carefully and methodically studied every one of the hundreds of allegations of atrocity, crime, and misdeeds of any kind that Kotkin attributes to Stalin and his closest advisers. Furr has checked every reference, every article and book, that Kotkin cites as evidence. The result: Furr has found that every single “crime” Kotkin alleges is false - a fabrication. Not a single accusation holds up. On the evidence, Stalin committed NO crime, no atrocities – for if he had, Kotkin would surely have uncovered at least one. Furr’s exhaustive research shows that Soviet history of the 1930s, has been falsified. Furr’s book is a model of meticulous examination of evidence and careful, objective analysis and deduction. “Stalin. 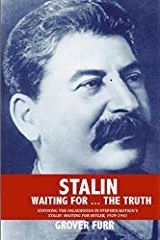 Waiting For … The Truth” exposes the lies and falsehoods behind Soviet history of the 1930s with the same meticulous attention to detail as his previous works: “Khrushchev Lied” (2011), “The Murder of Sergei Kirov” (2013), “Blood Lies” (2014), “Trotsky’s ‘Amalgams’” (2015), “Yezhov vs. Stalin” (2016), “Leon Trotsky’s Collaboration with Germany and Japan” (2017), and “The Mystery of the Katyn Massacre; The Evidence, The Solution” (2018)."